IMSC - Interactive Marketing Shopping & Communications maintains this website for your information, education, and communication. Unless otherwise indicated, you may download material displayed on this website for noncommercial, personal use only, provided you also retain all copyright and other proprietary notices contained on the materials. You may not, however, distribute, modify, transmit, reuse, repost, or use the content of this website for public or commercial purposes, including any data, text, images, audio, or video without the prior written permission of IMSC. The editorials, design and programming projects contained in this website, except when mentioned otherwise, are property of IMSC and protected by copyrights and other means of protection for property rights. The photos presented are property of their respective authors. Although the contents have been obtained from sources believed to be reliable and regularly updated, the IMSC does not guarantee the accuracy or completeness of any information contained herein, nor shall it be in any way liable for any delay in keeping such information current. The companies which participate/advertise in the project are responsible for all the information published by them in their sites, including fares, rates and reservations, and Búzios On Line has no responsibility for these, and is only reproducing them here. Proposals for partnerships or cooperation are welcome. Please contact us directly at IMSC via e-mail at imsc@imsc.com.br. 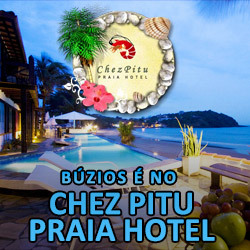 To advertise on the Búzios On Line, click here. Hotels and Inns Options for all tastes, budgets and styles. Food and Drink Rua das Pedras, Orla Bardot and Porto da Barra offer worldwide flavors. Activities and Attractions In the water or on land, there are many ways to enjoy the city. Directions Learn how to get to paradise. By car, bus, plane or boat!